Three chefs will skip the meat but not the hearty at Mohawk Bend. The Vegan Burger Showdown comes to Mohawk Bend on Monday, July 30. If the whole gang is going out for burgers, and that isn't quite your thing, what do you do? You go, of course -- you want to be with your people -- but then you end up ordering sides and waving off offers to try a different restaurant later in the night. Vegetarian and vegan takes on the classic burger are a mainstay, though, and have been for years, even if they aren't on the menu of the place you and your gang dine. But less common? A whole event built around creating really interesting and robust non-meat patties. Mohawk Bend is preparing to take on the vegan burger during one special night on Monday, July 30. And it is such a thing that they've rounded up some non-Mohawk Bend chefs, in addition to Mohawk's own Mike Garber, to build their best creations during the Vegan Burger Showdown. Chef Garber, Jet Tila of The Charleston, and Kajsa Alger of Street will be inventing the vegan wonders; judges will taste and snack and do their judging thing. And the public? We're invited to show from 6 p.m. to 9 p.m. to try out a Vegan Burger sampler plate for 12 bucks. Yep, you'll get to try each of the chef's meat-free wares. Call it meat-less Monday or call it a way to round up your traditional burger-loving friends for a night that is more your speed. Patties between buns come in all sizes, flavors, and types, of course; that's the beauty of the burger. It could be beef or way not beef. Us? It's all about the cheese and condiments. 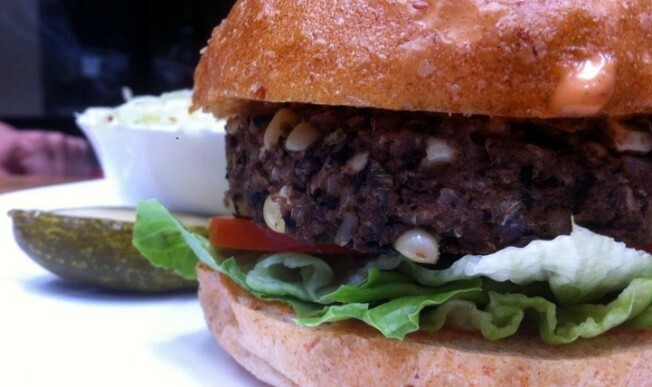 What will the Vegan Burger Showdown deliver in the way of mayo and gooey melty goodness? Chefs, we wait expectantly.